When Dale Carnegie wrote his classic book in 1936, communication technology as we know it was in it’s infancy. There were no cell phones. Communication methods that we take for granted such as texting, email, video conferencing, instant messaging, and voice mail, were still decades away. Yet, the time-tested principles of communication and human relationships he taught are just as valid and valuable today as they were then. In fact, with the often impersonal conversation methods we use today, Dale Carnegie’s advice is even more relevant in our digital world than ever before. With lightning-fast communication, the risk of misunderstanding or unintentionally giving offense greater than ever. And nurturing relationships is more important than ever. Now, updated for the 21st century you can learn these timeless principles using modern examples and incorporating the latest communication tools. While our modern communication tools are different, the principles of human communication and relationship building have not changed. 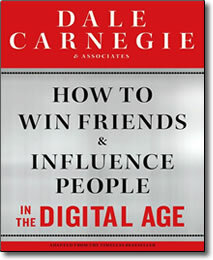 If you want to win friends and influence people in today’s digital world, just listen to Dale Carnegie.